Byron Bay Beach Hostel is the PERFECT accommodation for Schoolies! You can see why it’s rated as the Number 1 Schoolies accommodation in Byron. Categories: Byron Bay, Schoolies 2019. Tags: Byron Bay Schoolies, Schoolies, Schoolies 2019. Q) I hear that you can book an Official Byron Bay Schoolies Package for a 3-day, 4-day, 5-day, 6-day or 7-day stay on Any Dates over Schoolies, is this correct? A) Yes, it is! That’s great news for Schoolies as traditionally there has been little flexibility offered to Schoolies when they book (As they have been forced to book 7-days for set dates). But when you book your Official Byron Bay Schoolies Package with Sure Thing Schoolies, we allow you to choose your arrival date and your departure date. This gives you the freedom and control and saves you from paying extra money unnecessarily. You now have the option to book your Schoolies on Any Check-in Date for a 3-day, 4-day, 5-day, 6-day or 7-day stay. Just let us know your preferred Schoolies dates and we will be happy to assist. Q) What are these Official ALL Ages Byron Bay Schoolies Boat Parties I have been hearing about? A) They are Epic and hosted by the Sure Thing Schoolies Crew and as standard, you get to Party Hard on the Official Schoolies Party Boat Packed with Schoolies, 3 Hours of raves and action-packed entertainment, Awesome party host, Wild Schoolies Memories and great onboard Tunes. If you book when you secure your accommodation, you get a $10 discount! Q) What events or activities can Schoolies expect if they are under 18? A) Schoolies can get access to the bars and clubs if they are 18. Otherwise, there is a great Schoolies vibe at the Schoolies accommodation that can be enjoyed every evening for all Schoolies regardless of age. 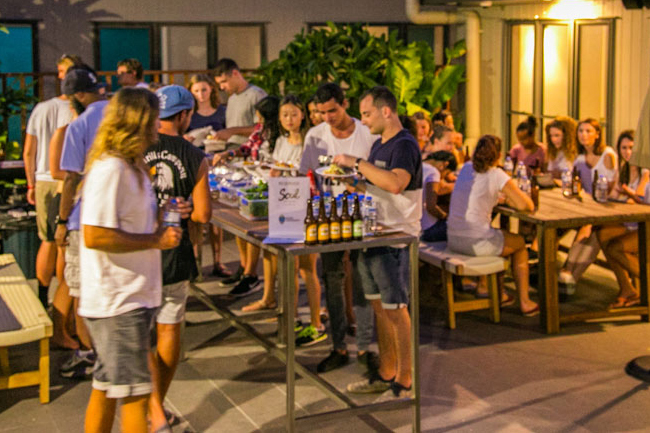 Staying at the Sure Thing Schoolies accommodation is a huge advantage for those who are under 18 as it gives you a venue to enjoy and celebrate your Schoolies week. We have the most epic parties and when you book with Sure Thing Schoolies, you get exclusive Free access to our Schoolies parties. We also have some epic 18+ parties as well. As part of your package, there is a 5 party pass included for FREE. Many companies charge big bucks for similar packages but with Sure Thing Schoolies, you get all this for FREE. Tickets are exclusive to Sure Thing Schoolies bookings. By booking with Sure Thing Schoolies for Byron Bay Schoolies, you are set to have the most epic week of your life for sure! There are are also 7 main bars and nightclubs for Schoolies who are 18+. Q) Do we have the Freedom to explore and enjoy the rest of Byron Bay? A) Yes. We understand that you want Freedom at Schoolies. You have the freedom to explore the beautiful Byron Bay area and experience the local culture. You can go shopping, do tours and activities as you wish. Q) Do the rooms have air-conditioning? A) Yes, your room will provide you with a cool escape from the summer heat, the rooms at Byron Bay Motor Lodge are air-conditioned. Q) Is alcohol banned at the accommodation? A) No, it’s not banned, but please consume it legally and responsibly. Q) What’s the food like in Byron Bay? A) Enjoy the amazing food available in Byron Bay. The food includes all the normal stuff you would expect such as Pizza, Chicken, Steak, Pasta, Fish and Chips, Wedges, Seafood, Burgers, Fresh Fruit. There are also supermarkets, cafes and restaurants close by. Q) Is Byron Bay suitable for people with dietary requirements such as vegan or vegetarian? Q) What Time Zone is Byron Bay in? Q) What is the check-in and checkout time at the accommodation? A) Check-in starts from 2 pm onwards. If you get there before 2 pm you may be able to leave your bags at reception whilst you explore the area. There may be many people checking in at once, so keep in mind that you may not be able to check in at exactly 2 pm. The whole group should check in together all at once. As for Checkout, you must vacate your room completely by no later than 10 am on the day of departure. Q) We’ve heard that Schoolies at the Byron Bay with the Sure Thing Schoolies Crew is awesome, is it? A) Yes, Sure Thing Schoolies hosts the Official ALL Ages Schoolies Parties. In addition Sure Thing Schoolies Resorts are rated 5-Star by the Sure Thing Schoolies Crew for their location and vibe. Byron Bay Schoolies 2017 was the best end to our school year!